Digital memorials can be as susceptible to vandalism as can traditional memorials such as grave stones. The picture above is of St John’s Church graveyard in Pemberton, Wigan in England taken in 2015. The picture was uploaded to a public Facebook group in the area and then used in a press article which reported on the crime. This type of vandalism happens a lot and is often committed by those who have entered an unlocked area at night. 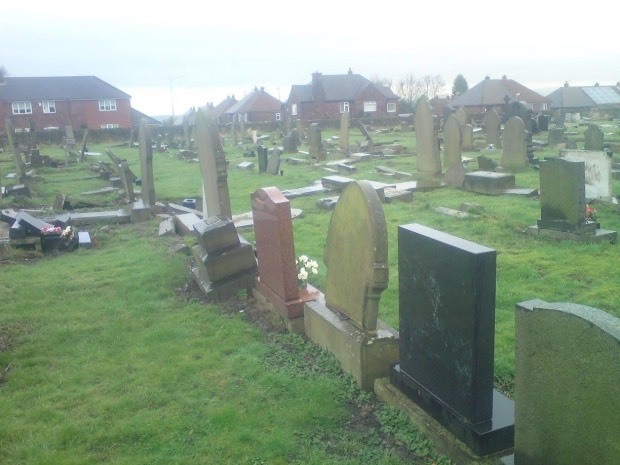 The use of unsecured graveyards is not unusual but often destructive behaviour can cause irreparable damage to fragile headstones and statues. On a recent walk in a graveyard I noticed a different type of crime, that of apparent theft. The picture below shows a memorial stone that has had some of the decorations removed, probably due to the material they were made of. I am supposing brass, copper or lead. Online and digital memorials can also suffer from vandalism. An episode of BBC crime drama Luther covered the story of a character who had created a digital memorial for his daughter, that became subject to a hate crime, committed by an internet troll. If you decide to memorialize a deceased person digitally, then being aware of this type of activity is important, however, there are ways to keep a digital memorial secure, whilst at the same time making them accessible to those who wish to visit them. What does happen though, as in the case of the vandalised gravestones, is that the memorials become neglected. As the years pass after a death this is inevitable, as those responsible for creating the memorials are no longer able to look after them. It would appear that when considering the future of memorials, that both physical and digital ones have a place in modern society, but they need maintenance if they are to last. Some older graveyards have been developed to make them more relative to modern society, such as the beautiful Arnos Vale Cemetery in Bristol UK. This Victorian garden cemetery and conservation park is being used as a community asset, and whilst it still respects the fact that it is a place of remembrance, it is able to combine the space for other uses, such as a wedding and function venue. The digital memorial site Gone Too Soon service has closed, but the bereavement charity Much Loved have been paying for their website hosting for a few months to allow people to transfer digital content before it gets lost. Next Next post: Fake News involves Funerals too!